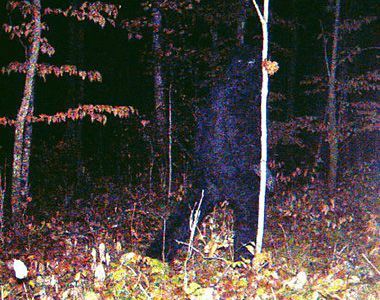 Remer Minnesota Declared "Home of Bigfoot"
It was this photo that was captured on a hunter's trail-cam in 2009 that really set the stage for Remer becoming the new "Home of Bigfoot." I heard from a Bigfoot researcher several years ago that thought this photo was a hoax, but I don't think it was ever proven to be real or a hoax. It remains a mystery, much like Bigfoot itself. To read more about the background of the photo click here. According to an article released by The Pilot-Independent in Walker, Minnesota — the Chamber of Commerce in Remer, Mn has declared Remer the official home of Bigfoot. So move over Pacific Northwest, there's a new sheriff in town. This designation is based on more than a century of sightings, events and stories in the area related to Bigfoot and a desire to have a central location for visitors to learn more about the history and the legend. Chamber members believe Bigfoot’s home was, and is, within the wooded lands that surround Remer. Even the town’s founder, William P. Remer, is rumored to have found tracks that belong to Bigfoot. The Remer Chamber of Commerce will host a kick-off celebration April 9. It includes a presentation by the head of Bigfoot Research in Minnesota, a luncheon, live entertainment and a Bigfoot scavenger hunt. This picture SCREAMS HOAX, and IS without doubt, a guy in a costume. The shape, uniformity of fur and color, to the cuff of the sleeve going straight across the wrist, to the rubber hand. Here is a link to what I think the user was wearing to perpetuate this hoax.